Loudspeakers are sometimes tough to wrap your ears around. Switching from one speaker to another often requires a re-orienting, or more precisely, a re-tuning of one’s audio sensibilities. The traits of one speaker versus another are often immediate and jarring. Changing amps or source components can, unless something is seriously amiss, require concentration to perceive differences. So it was with the Spendor D7, compared to my PSB T8 speakers. But it didn’t take long to realize that the Spendors were something special. As well they should be for $7,695 CDN (~$5,900 US) a pair for standard veneers, $8,995 for the ebony version I had for review. I’ve taken the mickey with Brit-fi recently, but that must end. Most of it was directed to transistorized horrors from decades past. The Brits have moved on, and so must I. When offered the opportunity to review the D7’s, I looked them up online. 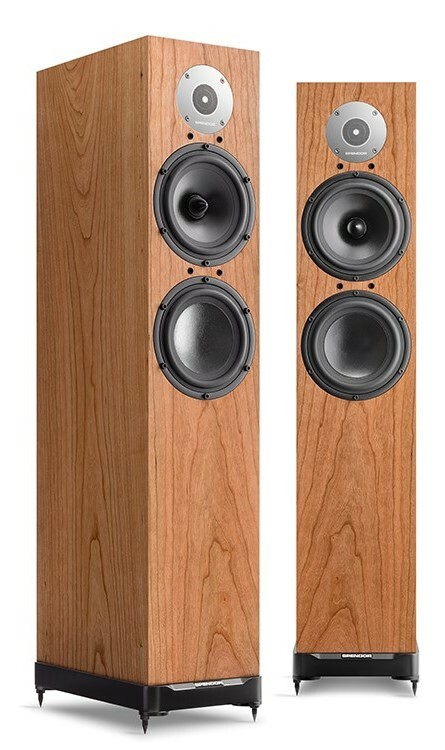 They appeared quite monumental on the Spendor site https://www.spendoraudio.com/ but this was due to them being photographed from a low angle. In the flesh they look more diminutive, even a bit disappointing, size wise. The D7’s I reviewed were a limited edition, veneered in Macassar ebony as shown below. They are beautifully finished, one strip of veneer goes up one side, across the top and down the other side. My favourite product model and a D7, but the speaker is available, more affordable and has a twin. Photographs don’t do them justice. Their exterior finish almost looks too good to be real wood. But it is real and most people can’t help caress it. The front and back are veneered as well. I won’t bore you with the technical details, you can find them on the Spendor site. At first, I thought a British 2½ way speaker, two woofers and a dome tweeter, ho hum. On closer examination the lower woofer, effectively a 6 inch diameter unit, is just that, a woofer. The other 6 inch “woofer” is actually a woofer and a midrange, that crosses over to a dome tweeter behind a metal grill. I must say I like Spendor’s bespoke binding posts. They’re recessed, out of the way, low-down on the back just above the bifurcated rear port. Instead of the usual generic hex posts these have a nicely knurled ridge that’s easy to grip. Just a single pair too. None of that bi-wire nonsense with goofy straps connecting both sets of posts. I put the D7’s in the position vacated by my PSB speakers. The bass sounded a bit thin, so I moved them closer to the rear wall, and the bass was weaker still – not the usual occurrence. Moving them about 12” forward from the locations occupied by my PSB’s, the bass was better and everything was clearer over-all. Spendor recommends aiming the D7’s at the listening position which in my room is about 13 feet away. I found this a bit too bright with substandard, i.e. most, 16/44 digital files. Aiming the speakers straight back, parallel with the room’s side walls, made for a decent compromise. I the subheading I alluded to the Spendors being fast. They are indeed. This caught me by surprise as they almost have the transient speed normally associated with electrostatic speakers, but not the microscopically small sweet spot associated with some of that breed. Nor do the Spendors require heaps of high current, heroic amplification to wake them up like some electrostats and planar dynamic speakers. The speed and detail of the D7’s draw you in. But they’re not just about speed. Their transient attack, something usually associated with thin-diaphragm planars and electrostats (powered by sizeable amplifiers) or high-efficiency horn loaded speakers (driven with low power tube amplifiers), is something that I haven’t heard in “box” speakers before. Well-recorded percussion instruments have the attack and startle factor, more like what you experience in live music. It’s not just, for instance, the initial hit of a stick on a drum head; the D7’s follow it up with the sound of drum body as well. They also have a captivating way of hanging on to sounds and not truncating them as they decay. Unlike many conventional “speakers in a box”, they don’t need to be cranked up to be woken up. This doesn’t mean the D7’s are ruthlessly revealing, I wouldn’t characterise them as especially bright in the treble. They tread the fine line between “too bright” and “insufficient detail” very well. They don’t make some digital horrors sound worse than they are, but if recordings have filigreed detail, they’ll respond to it in a lovely and engaging manner. Through the midrange, the D7’s were truly beguiling. Strummed guitars, pianos, female and male voices, wind instruments, bowed strings, they all sounded rivetingly present, given decent recordings. This wasn’t hyped-up midrange to grab your attention. It just seemed easy and natural. The bass, though not especially deep – you can only expect so much from two 6” woofers – was very fast, tuneful and detailed. No soft, soggy or slow bass here. To break the various parts of the audio spectrum up like this is to do the Spendors a disservice. I found myself having to concentrate on different parts of the audio band, when really, the D7’s do such a coherent job of putting it all together that I just wanted to groove along to whatever music was playing. Sometimes the tweeters seemed to “speak” out a bit too prominently, but this was almost entirely due to overly bright recordings. If you are into imaging and soundstaging, the D7’s won’t disappoint. Those factors are not usually such a big deal to me, but the depth and breadth of sonic landscape thrown up was better than I’ve heard before in my room, or many others for that matter. Maybe it’s more important to me than I thought, now that I’ve heard it so richly portrayed. Most of the listening was done with my ARC REF 3/REF 110 pair, the source being my NAD 50.2 digital music player feeding the DAC section of my Cambridge 840C. An audiophile friend and I spent an afternoon listening to vinyl and high res files with the recently-reviewed Shindo Auriegés substituting for the REF 3. He fell in love with the D7’s and I can certainly understand why. The majority of listening was done with tube amplification – an Elekit TU-8340VK and Finale F-7591 saw some service as well. If you think you can dust off an old Dynaco or heat up that old Heathkit you got at a garage sale, think again. Something in a modern tube amp with at least 40 watts of clean power, depending on room size and musical tastes, is called for. It’s not that the D7’s are inefficient, but to limit peak power might not allow them to cleanly achieve the dynamic response they are so adept at delivering. Not to disparage old tube amps – they can be competitive, sound wise, when completely rejuvenated. In some instances, rejuvenation involves keeping the transformers and throwing almost everything else away. Late in my time with the D7’s, a Bryston 2B SST (60 watts into 8 ohms) replaced the ARC REF 110. Some speakers are described as tube-friendly and some even as tube-necessary, to tame their strident ways. I think the D7’s could best be described as amplifier-neutral. The diminutive (by Bryston standards) 2B proved to be a very sympathetic companion to the D7’s. Brystons have always been known as the aces of bass, and it was true with the Spendors. It got a slightly better grip on the D7’s woofers than did the ARC Reference 110. The ARC provided more luminous midrange and treble textures, and a noticeably larger and more detailed sound stage, but the little Bryston was not thoroughly out-classed. It seems that you can have your choice of amplification with the D7’s. It’s not one of those speakers that dictates the amplifier it prefers. See more on this topic at the end of the review. If I must be critical of the D7’s, it’s that they won’t play super loud without starting to sound strained. Only so much can be expected from what are essentially two 6” woofers. If you are a head-banger, or listen to Mahler symphonies like you’re sitting front row center, or are into pipe organ music at “you are there” levels, the D7’s might not be for you. For the rest of us, they will likely satisfy at all reasonable volume levels. The question you might be expecting me to answer is whether or not I’d spend my own money on them. Tough to say. I think in my room, for my musical tastes and assuming no budgetary constraint, I’d want to have a long listen to a set of Spendor D9’s. They are much like the D7s but have one more woofer, that might satisfy the bass hog in me. I’m trying to ignore the fact that the Spendors must leave soon. The thought that reconnecting my PSB’s might seem like a down grade is a scenario I’m trying my best to ignore. I’m afraid they might seem rather bland and uninvolving, compared to the D7’s. All in all, the Spendor D7 is a wonderful loudspeaker. They will challenge the rest of your system and your digital files or LP’s to bring their A game. The D7 is the sort of audio component that you buy once and you’re done, they’re that good. Starting at $7,695 CDN a pair, they’re not an impulse purchase. But if you want the best, from people who’ve been around a while, who do their own materials research to achieve this level of performance, and who pay real-world wages and benefits in a western democracy, this is what it costs. The Spendor D7 might not get your attention visually and sonically on casual acquaintance, but if you take time to get to know a pair, you might find them essential to your enjoyment of recorded music. I’d like to think that Miss K is looking these up online after hearing them, but not likely. Probably booking a yoga class. Thanks ever so much to Peter Wolter, proprietor of Being There Audio in Orangeville, Ontario, for the kind loan of the Spendors and other audio gear. If you live within a half days’ drive, it’s worth the trip. He also has a selection of used vinyl. Visiting his shop is always a pleasant experience. Call or email before you set out, Peter’s hours are sometimes a bit irregular. He has special deal on the ebony version shown here if you are interested, and a variety of amplifiers with which to audition them. Take a few LP’s or files on a thumb drive and Peter will be more than happy to play them. In the spirit of Rick Mercer, I’m going on a rant with this review and, with a little sufferance from the boss, in future reviews as well. (Go for it, I’m not paying by the word. -Ed.) I’m well aware that a rant likely says more about the ranter than the subject she or he is ranting about. Whether you agree or disagree with what’s written, feel free to leave a comment below, or rant away yourself. It’s all in the spirit of (mostly) civilized discussion. One of the first things I look for, in speaker reviews that include measurements, is the impedance curve. In some instances, speakers that are rated at 4 ohms will drop to around, and, in some instances slightly less than 2 ohms! Granted, these are mostly speakers in the $20,000 a pair and up category. They’ll likely be used with heroic (and expensive) amplification from the likes of Levinson, Pass, or D’Agostino to name just a few – amps that will oblige the speakers’ hunger for amperage. I’m not belittling the sonic achievements of these amplifiers, nor am I jealous of anyone who owns them. The only thing I might be slightly envious of is someone’s LP or high res download collection. If someone has the dosh to drop on ultra-expensive gear, I’m happy for them, no kidding. They are supporting the bleeding edge of sound reproduction technology and that progress will filter down to all of us. Mr. Pass is to be especially commended for his outside the box (now there’s a ‘90s expression) First Watt amplifiers and his support of the DIY community. The thing that irritates me is speakers in the $1,000/pair and up category, that also have current hungry impedances. In my view their designers are, if not wilfully, then by negligence, showing contempt for the potential purchasers of their speakers, by forcing them into amplifiers that might not be the purchaser’s preferred choice. I know Ohms Law, but otherwise I’m am electronic ignoramus. However, it seems to me that if you start with a 4 ohm driver, and the cabinet and/or crossover effects drive it down into the 3 ohm or even lower range, why not start with an 8 ohm driver? Then audiophiles can use a less expensive and less complex amplifier, be it tube or solid state, of their preference. End of rant. Obviously, this rant does not apply to the Spendor D7. From what I’ve read, the impedance curve does not drop below 4 ohms, and is well above that figure through most of the audio band. 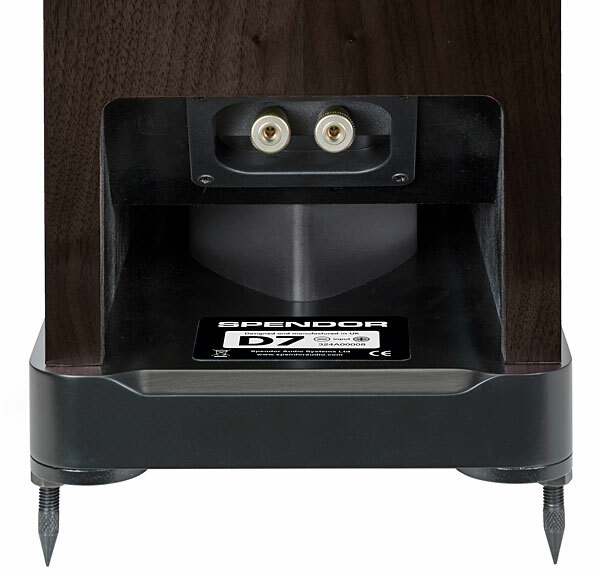 Spendor is to be commended for allowing audiophiles their choice of amplification. That’s not to say amplifier choice is trivial. The D7 begs to be fed a high-quality audio signal. It just doesn’t need back-breaking and wallet-busting quantities of it. Steve: Good god man, Miss ‘K’ was the best part(s) of the review -by a long shot. Bless her ! Soooo, is the D-7 a ‘2.5-way’, or not ? I have no doubt these are fine loudspeakers, but that narrow (and pencil-thin spiked) speaker base/platform looks really ‘cheezy’ on a $8K product. At in/around that price point, one could consider the genuine 3-way (and brilliant) KEF REF-1’s. And others in/around that price point, as options increase as we enter the nearing-$10K price-points; I believe readers would like to know how ‘X’ model compares with model ‘Y’. Although none ( to my mind) would compare to model ‘K’. In the end, Miss’K’ gets my vote for the best part of this review. Damn. Lol. Thanks for your comments Peter. I’ve seen the D7 described as a 2.5 way, but not by Spendor. In the flesh, the base/platform looks appropriately scaled for the size of the cabinet. As far as reviews, we have to work with the timing and products that are available to us. I was prepared to be not that impressed by the D7’s but I was very pleasantly surprised. Point taken about true 3-way speakers in this price bracket, though looking back I think the speakers that have impressed me the most, coherency wise, have been 2 ways. And now a 2.5 way. The lovely Miss K (I’m her uncle) has appeared in previous reviews, and has agreed to grace future articles of mine as well. Hi Steve: Nice to hear from you. I honestly thought the gal in the pic’s was a professional model courtesy of Spendor. In the back of my mind was praying it wasn’t a woman you know personally -lest you think I was making inappropriate comments. I was not. I appreciate the clarification. Back to hifi: I see (now) why many listener’s (myself likely included) prefer 2/2.5-ways: 3-ways that do NOT x-over low enough (under/around 300 Hz.) have the task of both massive cone excursions (for low-bass) and setting the foundation for the immensely critical upper bass/lower mid-range band of ‘fundamental’ frequencies. Done right (3-way) the benefits are considerable. Done wrong and the deficiencies even more so. Spendor makes a fine product -the ‘D-series’ a case in point. Yet I have a hard time believing the supplied base/platform provides a secure/stable footing; extending depth/width of the supporting base is not rocket science. It surprises me that Spendor (and others, hello Totem) does not take more care/concern with this ultra-critical interface.